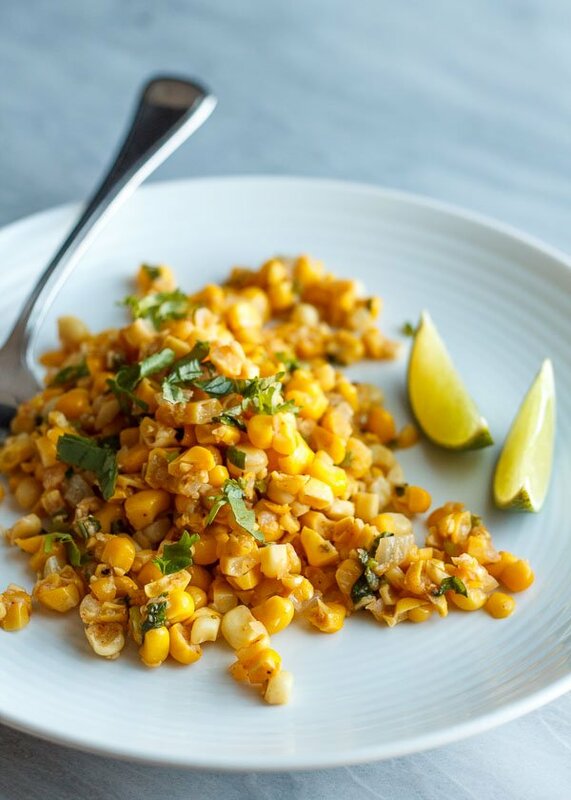 Make this buttery, spoonable corn off the cob with zesty lime, sweet ancho chili powder, melt-in-your-mouth onions, and a sprinkle of fresh cilantro before summer is over! 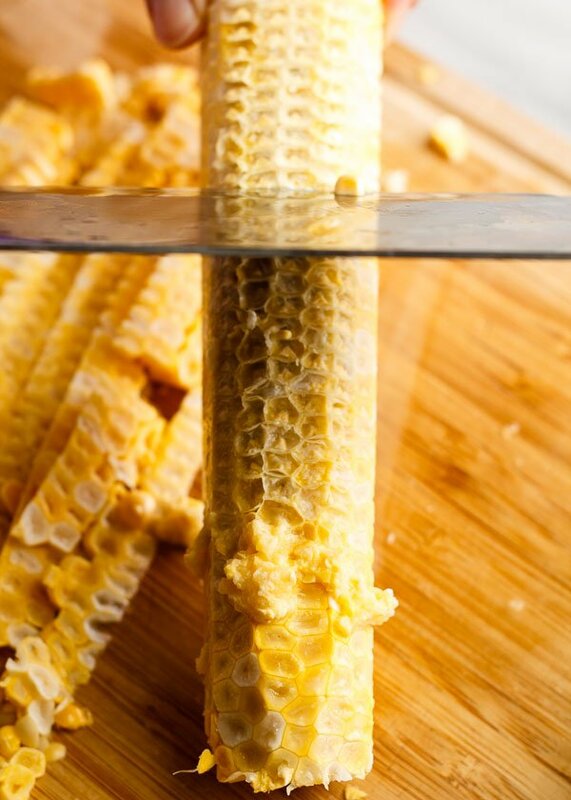 But first, let’s learn how to strip an ear of corn without making a total mess or wasting any of the tender germ, that precious bit inside each kernel considered to be a beautifying ingredient in traditional Chinese cuisine. 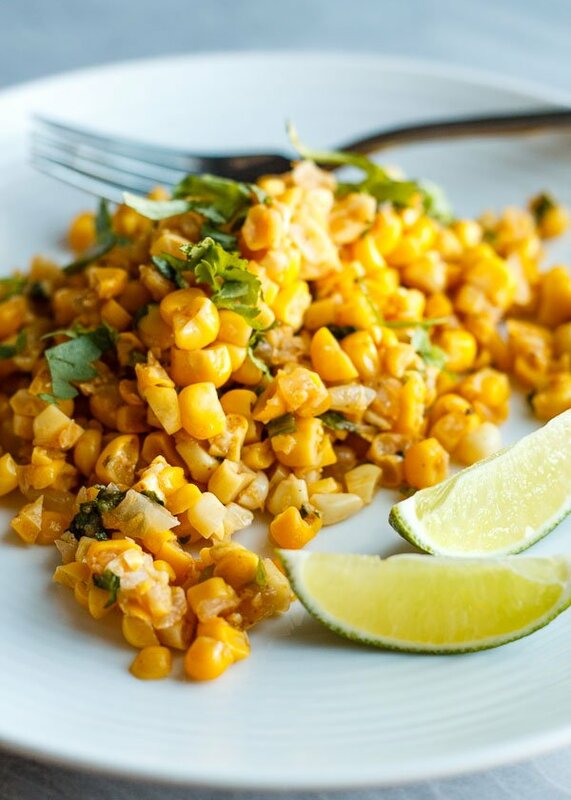 The original recipe for this dish has you stand each ear of corn up and shave off the kernels top to bottom. I’ve done this and the kernels go FLYING. All over your kitchen. Bah! Don’t do this. Not even in a big bowl, which is also really awkward because how the heck are you supposed to position your knife INSIDE a bowl? 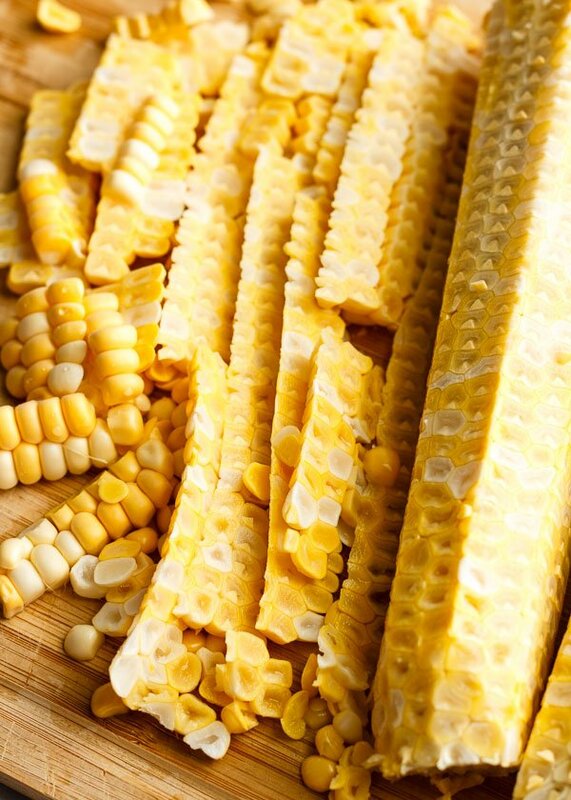 Why not just lay the ear of corn flat on a cutting board and slice horizontally? 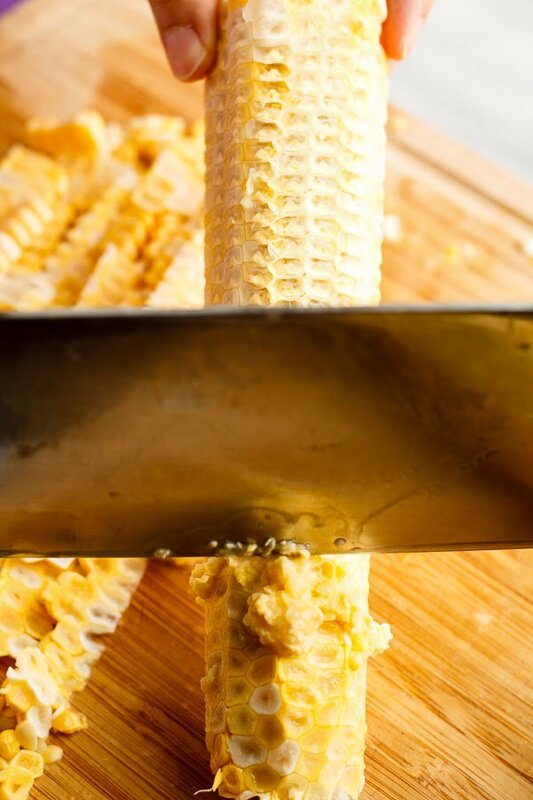 Keep rotating the ear of corn towards the knife and slice a few rows at a time, then stand the cob up and scrape the rest of the corn off. 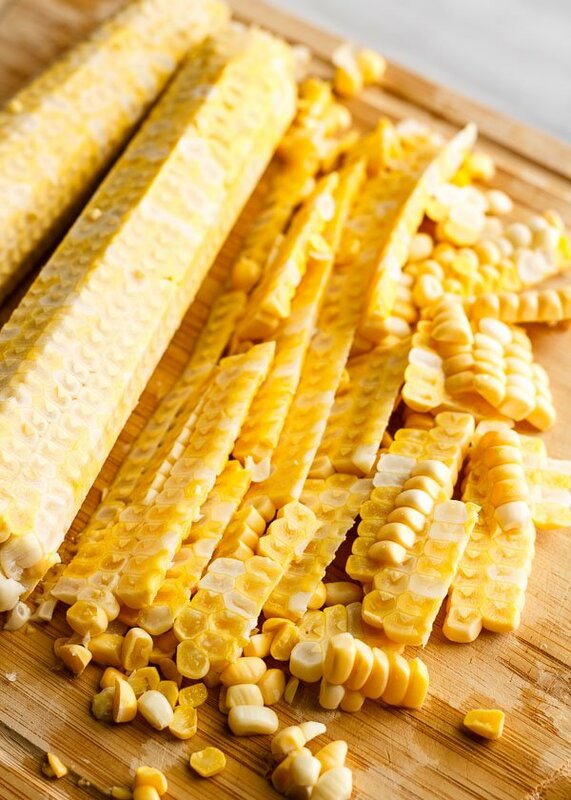 Use your sharpest knife and start around the middle, then flip the cob and repeat. This protects your fingers. The part you scrape away will be milky and starchy, basically the best part! I first had this dish when Kat brought it to my 30th birthday picnic last year, after she made it twice because she zested too much of the lime peel (including the white part) into the first batch, which made it bitter. So take note: very lightly zest your lime. I only run my microplane once over the lime. Don’t run your zester back and forth over the surface. Too much. Melt 1 tablespoon of the butter with the olive oil in a large skillet or pan over medium-low heat. Add the onions and mix in 1/2 teaspoon salt. Cover and cook, stirring occasionally, until translucent, about 5 minutes. Uncover, turn up the heat to medium, and saute, stirring frequently, until lightly browned, another 4 to 5 minutes. Add the remaining 1 tablespoon butter, the corn kernels, and another 1/2 teaspoon salt. 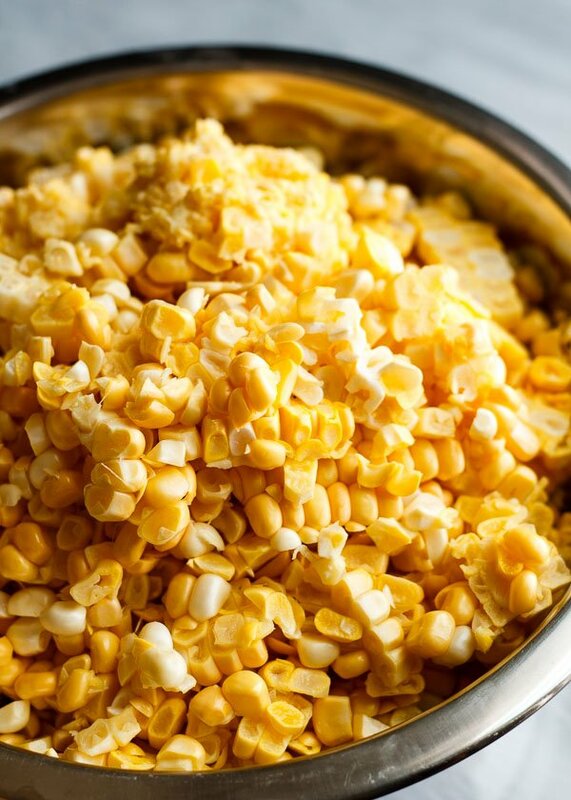 Sauté, overturning the mixture frequently to cook it evenly, until the corn is tender, about 4 to 5 minutes. Add the chile powder and lime zest. Cook for 1 more minute. Remove the pan from heat. If the bottom of the pan is browned, let the corn sauté sit undisturbed for 2 minutes (moisture released from the vegetables as they sit will loosen the browned bits), then stir again, scraping up the browned bits from the bottom of the pan. Season the sauté with a few generous grinds of pepper and squeeze in the lime juice. Stir in half of the cilantro. Serve with the rest of the cilantro and extra lime wedges. Made this for dinner tonight as a side for carnitas. Ended up putting the corn into the burritos….oh so good. Thanks. This sounds and looks so lovely and fresh! Pinning! Loving the flavors here! 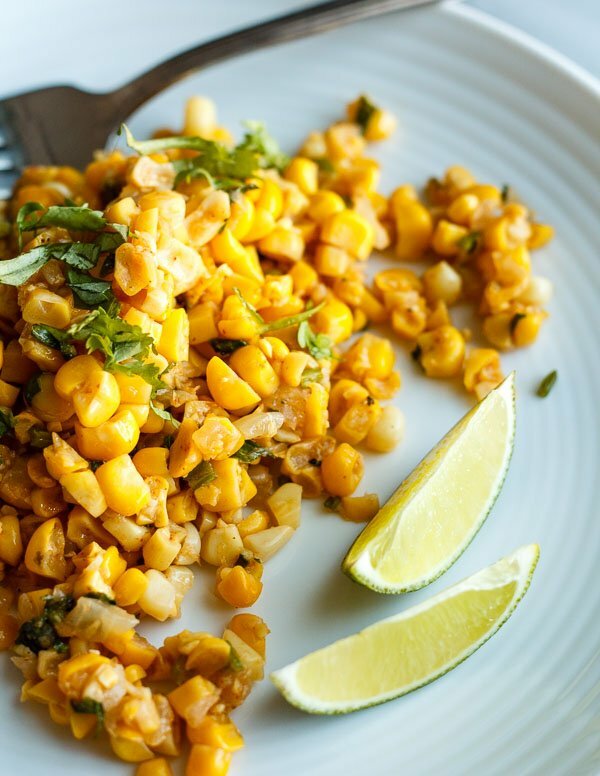 The ancho and lime sound heavenly with the buttery corn 🙂 Pinning!